The U.S. SEC has made its first move against crypto-currency exchanges. On 8 Nov, the SEC charged decentralized exchange (DEX) EtherDelta’s co-founder Zachary Coburn with operating an unregistered national securities exchange between 12 Jul 2016 to 15 Dec 2017. Coburn agreed to pay a total of US$ 388,000 under the settlement. The decision is based on the preceding DAO token ruling of July 2017. In the DAO ruling, the U.S. SEC advised that a platform must register as a national securities exchange if it offers trading of digital assets that are securities, and is operated as an “exchange” as defined under section 3(a)(1) of the Exchange Act. EtherDelta met the definition of an exchange under Coburn’s ownership, as it facilitated the trading of more than 3.6mn ERC20 tokens, including tokens considered securities by the SEC. EtherDelta further exhibited characteristics of an exchange by charging parties accepting trades a 0.3% transaction fee. Coburn wrote the EtherDelta smart contract, yet failed to include trading restrictions on particular ERC20 tokens deemed securities by the SEC. His subsequent failure to register EtherDelta as a national securities exchange, or apply for exemption, thus constituted a knowing breach of section 5 of the Exchange Act. 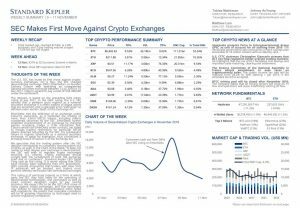 We speculate that the trading pattern after the SEC decision corresponds to customers moving tokens out of DEXs, as seen in the Chart of the Week. “It does not matter to what degree your exchange is decentralized, the SEC will seek to regulate crypto exchanges servicing U.S. citizens. Crypto exchanges should comply with the jurisdictions of both the exchange itself and its customers”, Standard Kepler CEO David Tang said on the ruling. It is worth noting that DEXs have recently been tightening their KYC procedures. IDEX recently announced that traders with New York IP addresses will be blocked, and traders must perform identity verification like centralized exchanges. This ruling is of particular interest as it hints at which party the SEC may hold liable for the operating of decentralized technologies, and exchanges as well as smart contract designers ought to pay careful attention. We expect this to be the SEC’s first move of many against crypto exchanges, and that exchanges may choose to sacrifice decentralization when faced with regulations. We predict that reputable custodians will be of growing importance as exchanges seek to achieve regulatory compliance.